Have you been struggling to learn ArchiCAD? Feeling a bit frustrated? The QuickStart Course by Eric Bobrow is a set of easy to understand training videos that will take you from starting up ArchiCAD all the way through creating a complete building with construction documents. Unlike some online training resources, this well-organized series will teach you the important concepts that will allow you to stand on your own. With over 13 hours of material broken up into 7 modules and 29 individual lessons, the QuickStart Course covers a lot of ground yet is easy to digest. Eric Bobrow’s unique teaching style is relaxed and unhurried, yet carefully explains methods and approaches that every user must know to be successful. The main course covers all versions from ArchiCAD 10 through 16 plus the Start Edition, and is conducted using both imperial and metric systems. Supplemental lessons cover new features introduced in ArchiCAD 17 through 20. Whether you’re a total novice, someone who’s tried before but couldn’t get over the hump, or an intermediate level user who is out of practice or has missed out on some of the foundation basics, the QuickStart Course will move you along quickly towards proficiency, confidence and enjoyment. The QuickStart Course was developed as part of Bobrow’s massive Best Practices Course to help newer users get up to speed. Now, for the first time available as a separate training, the QuickStart Course is your key to getting productive within the first few days of starting to use ArchiCAD. The video lessons are available for viewing any time in your web browser, and may be downloaded to your computer for offline access. An optional DVD with all the videos is available for an additional $19 including shipping anywhere in the world. “If you are using ArchiCAD, this is the best money you can ever spend. Your confidence and efficiency will improve exponentially. 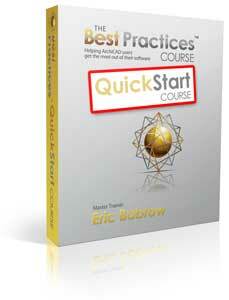 The QuickStart Course is a great value by itself, but you’ll also get 3 powerful extra bonuses! One month of access to the ARCHICAD Coaching Program – a live two hour training webinar run twice each month – ask your questions, watch and listen as Eric explains and creatively demonstrates relevant concepts and builds the answer onscreen; if you can’t catch it “live” you can watch the recording later. Free access to the first 5 weeks of the Best Practices Course, teaching you the best ways to get yourself organized and set up your office template as well as general notes and specifications. Full credit towards registration for the Best Practices Course – the money you invest today may be applied towards course registration at ANY later date – so this is a starter course that can be the first step in your larger journey towards ArchiCAD mastery! Click the Add to Cart button and you’ll get immediate access to the QuickStart Course as soon as your payment is processed! The QuickStart Course is offered with a complete, no-questions asked 90 day money back guarantee. If you decide after watching some or all of the video lessons that this isn’t for you, that you haven’t been able to really get started productively with ArchiCAD, simply send us an email and you’ll get your money back promptly and courteously. “I have been refreshing my ArchiCAD skills after having to use another CAD program for the last couple of years. The QuickStart course, along with the Best Practices course, has made this painless, and is taking me to a skill level that I have longed for for many years. Here’s How to Find Out More! Feel free to browse around the QuickStart Course website. You can review the course outline, and visit the actual lesson pages. The first 6 of the 29 video lessons in the QuickStart Course are available for viewing by guests, so you can watch almost 2 hours of material without charge! You’ll also find an entire page of enthusiastic comments by course members about the QuickStart Course. When you’re done checking it out, come back here and sign up! It will be one of the best decisions you ever make, I promise. Click the Add to Cart button and you’ll get immediate access to the QuickStart Course as soon as your payment is processed. “… one day while searching the Web for lessons I stumbled onto this fellow called Eric Bobrow. Well this would have to be the best money I ever spent. I believe Eric’s course should be the tutorial that is supplied with ArchiCAD. The lessons are fun and very easy to understand and if you don’t quite understand something you just fire off an email to Eric and within no more than an hour you have your own personal answer direct from the guru himself. Wondering how much $197 USD is in your local currency? Use this free currency converter to find out (click the “Down” button to convert from USD to the currency you choose). Note that your credit card issuer may use a slightly different rate, so please consider this only as an estimate.